Publicity Stills of "X-Men: The Last Stand"
In X-MEN: THE LAST STAND, the final chapter in the “X-Men” motion picture trilogy, a “cure” for mutancy threatens to alter the course of history. For the first time, mutants have a choice: retain their uniqueness, though it isolates and alienates them, or give up their powers and become human. The opposing viewpoints of mutant leaders Charles Xavier, who preaches tolerance, and Magneto, who believes in the survival of the fittest, are put to the ultimate test – triggering the war to end all wars. This being the third and probably, final installment to the X-Men trilogy, it is time for the brotherhood of mutants to stand up and be counted for. The Last Stand faces a dilemma in satisfying the legions of fans that have spanned generations since the inception of the comic series. Much more is at stake this outing compared to its predecessors. The best thing about the X-Men films have always been the different characters who get the golden opportunity to make celluloid history. The Last Stand boasts the biggest line-up of mutants to date, a list which includes new inceptions like Beast, Angel and Juggernaut alongside returning characters like Wolverine, Magneto, Iceman and the returning Jean Grey. Picking up from where the previous film left off, the Dark Phoenix saga is placed at the forefront of this film. The resurrection of Jean Grey poses a major threat to the mutants. This happens amidst an America that has discovered a “cure” that could make the mutants more human. As a result, when issues like morality, humanity and isolation come into play, each mutant is forced to take a stand, to combat the cure or to forever remain mutant. The film opens twenty years in the past and we see a younger Professor X and Magneto, when they were still friends, visiting a young Jean Grey’s home. The witty repartee between both men as they face Jean Grey quickly reminds one how the two shared the strongest of friendships and yet despite their current differences, were still able to maintain much respect for each other. And as we are introduced to the young Jean Grey, we will realize the potential the child possesses. The setting is then forwarded to ten years in the past and we are introduced to a young boy attempting to peel and slice something from his back. We soon learn that the young boy is attempting to rid of new found wings which had just sprouted from his back. Both scenes start off the film aptly, hinting to us the sign of things to come in the film. Unfortunately, while the film starts off on the right note, the same cannot be said for its later parts. As the film progresses and the rest of the characters introduced, the film has moments which are marred by particularly bad acting, extremely amateurish wireworks and a lack of characterization. The bad acting comes from the extras like the President, his cabinet and soldiers and the wireworks appear more like an ode to old period films. However, for such an epic scale for an X-Men film, the characters are two-dimensional. Most of what you see of Angel is already shown in the trailers and the likes of Juggernaut and Colossus are unfortunately, underused. Nonetheless, the film has a number of jaw-dropping scenes, one of which involves the Golden Gate Bridge. 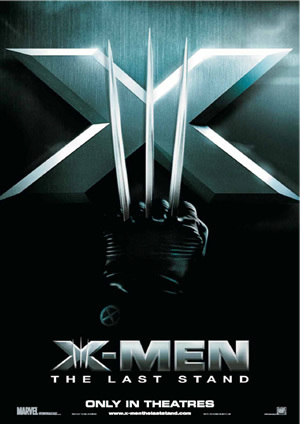 However, it is the one scene when Jean Grey is revisited at her home that will justify the price of your ticket and also the best scene you can’t find in the other summer blockbusters, with its guaranteed serving of suspense, action, disbelief and tragedy that is bound to draw your tears. A pharmaceutical company declares that it has discovered a “cure” that is able to rid mutants of their “illness” provides the crux of the film. This leads them to drawing mutants to come forth voluntarily to cure themselves and in turn, angering Magneto and the Brotherhood. When Magneto discovers that the Government has allowed the sanction of the “cure” to be used in guns, he rounds up an army of mutants and sets forth to destroy the makers of the cure. As this happens, Professor X’s students and leaders are forced to make a choice in following Magneto in his quest or to tolerate and practice diplomacy instead. The result is a finale that is not only packed with tons of action but also one that is driven by issues of betrayal and solidarity. Despite the entire furor surrounding Brett Ratner’s appointment as Bryan Singer’s eventual replacement, the former has done a commendable job with The Last Stand. Sure, there are anti-climatic scenes which may frustrate fans around the world but the end result is one that is satisfactory. However, as The Last Stand is a culmination of a trilogy, it therefore, aspires to be epic. While the physicality of the film may feel epic, emotionally, it lacks the punch that would make it larger than life, which sadly is its ultimate flaw. P.S. For fans of the series, there are countless Easter Eggs to pick out from the creator of the comics, Stan Lee to the different unnamed characters and even hints of a character’s evolution. And oh, there is a scene after the credits have rolled, that hints at a probable sequel, enough to tingle and stir your mind.